Sanssouci is the name of the former summer palace of Frederick the Great, King of Prussia, in Potsdam, near Berlin. 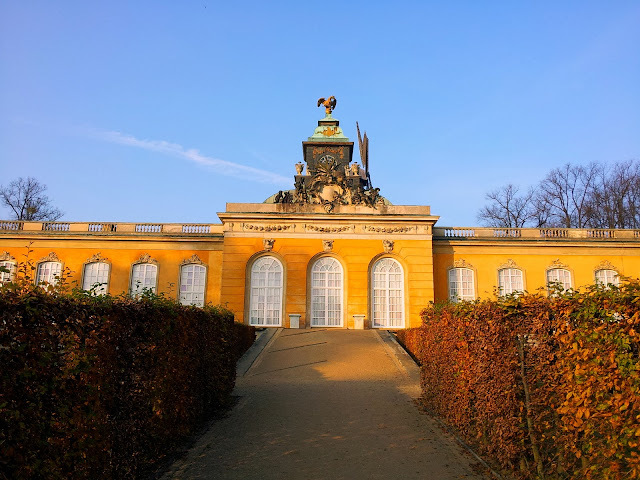 The palace was designed by Georg Wenzeslaus von Knobelsdorff between 1745 and 1747 to fulfill King Frederick's need for a private residence where he could relax away from the pomp and ceremony of the Berlin court. 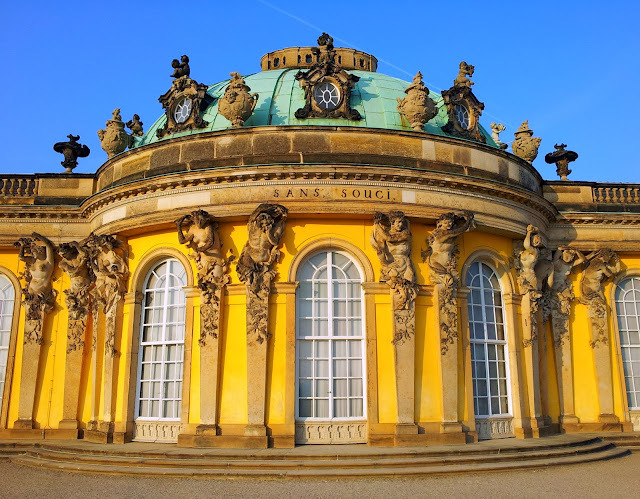 The palace's name emphasizes this; it is a French phrase (sans souci), which translates as "without concerns", meaning "without worries" or "carefree", symbolising that the palace was a place for relaxation rather than a seat of power. Containing just ten principal rooms, it was built on the brow of a terraced hill at the centre of the park. The influence of King Frederick's personal taste in the design and decoration of the palace was so great that its style is characterised as "Frederician Rococo", and his feelings for the palace were so strong that he conceived it as "a place that would die with him". In the park, east of the palace, is the Sanssouci Picture Gallery, built from 1755 to 1764 under the supervision of the architect Johann Gottfried Büring. It stands on the site of a former greenhouse, where Frederick raised tropical fruit. 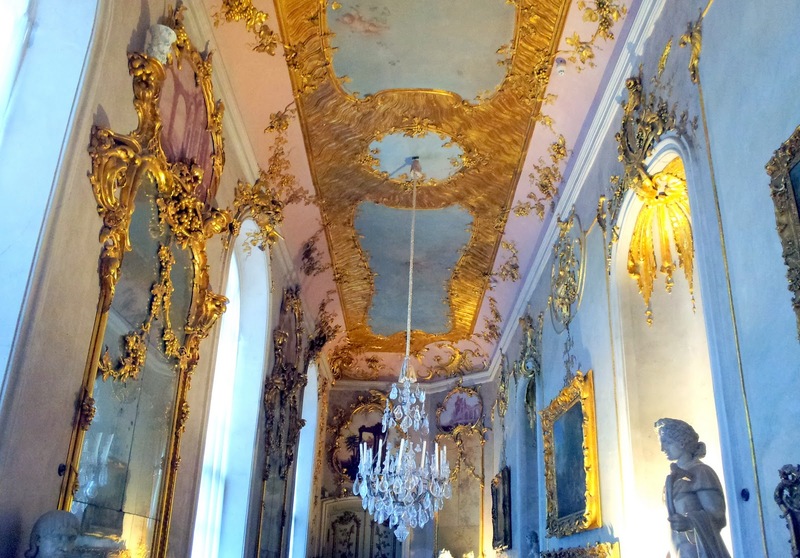 The Picture Gallery is the oldest extant museum built for a ruler in Germany. Like the palace itself, it is a long, low building, dominated by a central domed bow of three bays. 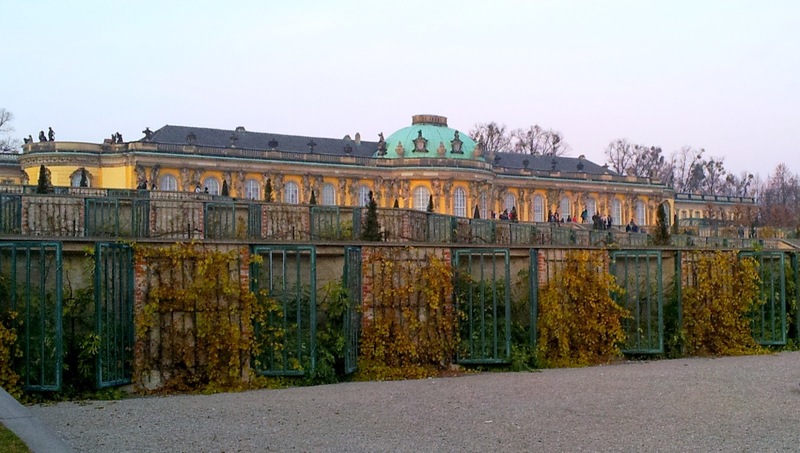 In the Baroque tradition, the principal rooms (including the bedrooms) are all on the piano nobile, which at Sanssouci was the ground floor by Frederick's choice. While the secondary wings have upper floors, the corps de logis occupied by the King occupies the full height of the structure. Comfort was also a priority in the layout of the rooms. The palace expresses contemporary French architectural theory in itsapartement double ideals of courtly comfort, comprising two rows of rooms, one behind the other. The main rooms face the garden, looking southwards, while the servant's quarters in the row behind are on the north side of the building. An apartement double thus consists of a main room and a servant's chamber. Doors connect the apartments with each other. 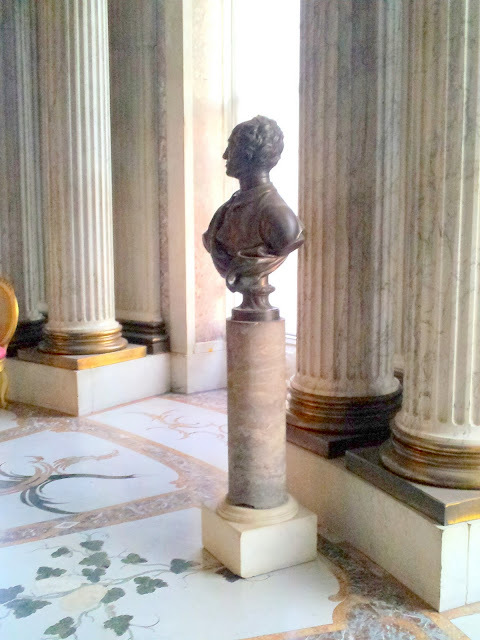 They are arranged as an "enfilade", so that the entire indoor length of the palace can be assessed at a glance. 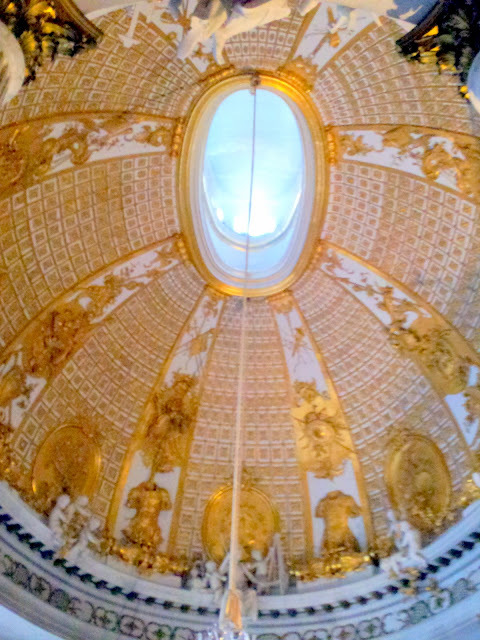 The white-and-gold oval Marmorsaal ("Marble Hall"), as the principal reception room, was the setting for celebrations in the palace, its dome crowned by a cupola. White Carrara marble was used for the paired columns, above which stucco putti dangle their feet from the cornice. The dome is white with gilded ornament, and the floor is of Italian marble intarsia inlaid in compartments radiating from a central trelliswork oval. 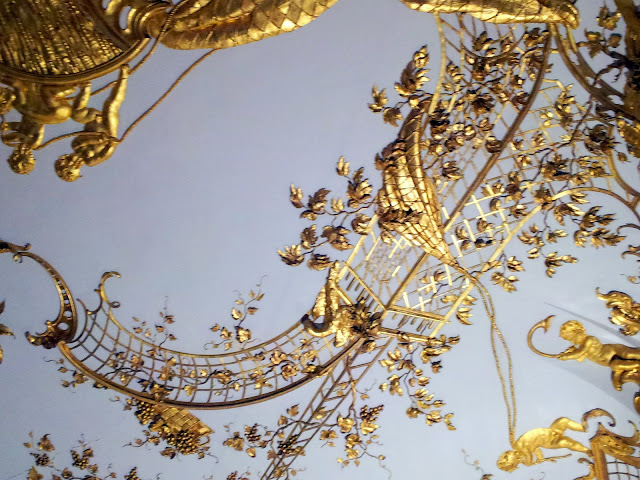 Three arch-headed windows face the garden; opposite them, in two niches flanking the doorway, figures of Venus Urania, the goddess of free nature and life, and Apollo, the god of the arts, by the French sculptor François Gaspard Adam, established the iconography of Sanssouci as a place where art was joined with nature. 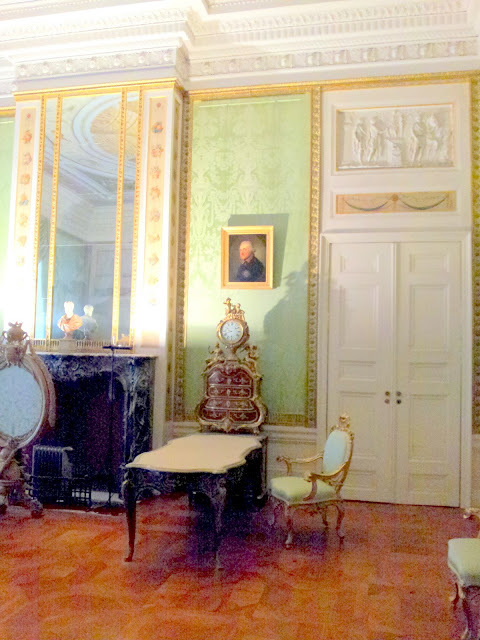 The King's study and bedroom, remodeled after Frederick's death by Frederick William von Erdmannsdorff in 1786, it is now in direct contrast to the rococo rooms. Here, the clean and plain lines of classicism now rule. 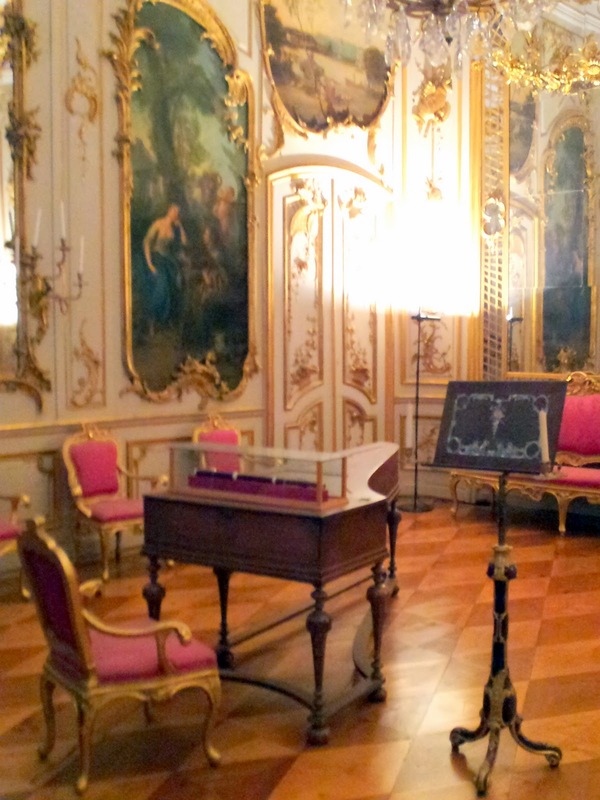 However, Frederick's desk and the armchair in which he died in were returned to the room in the middle of the 19th century. Portraits and once missing pieces of furniture from the Frederick's time have also since been replaced. The north facing gallery overlooked the forecourt. Here, again, Frederick deviated from French room design, which would have placed service rooms in this location. Recessed into the inner wall of this long room were niches containing marble sculptures of Greco-Roman deities. Five windows alternating with pier glasses on the outer wall reflect the paintings by Nicolas Lancret, Jean-Baptiste Pater and Antoine Watteauhung between the niches opposite. To the west were the guest rooms in which were lodged those friends of the King considered intimate enough to be invited to this most private of his palaces. Two of Frederick's visitors were sufficiently distinguished and frequent that the rooms they occupied were named after them. The Rothenburg room is named after the Count of Rothenburg, who inhabited his circular room until his death in 1751. 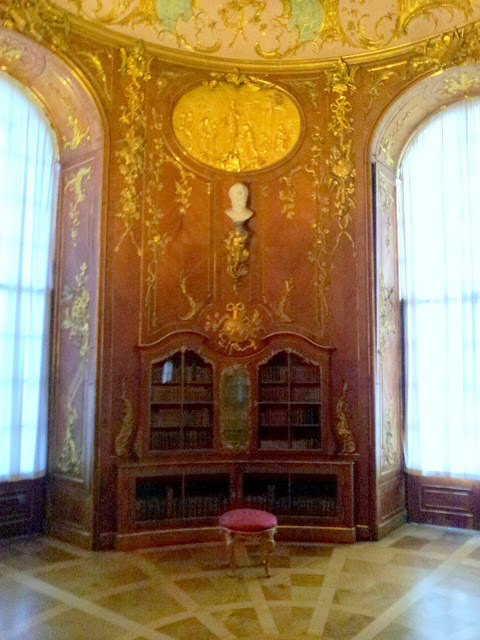 This room balances the palace architecturally with the library. The Voltaire Room was frequently occupied by the philosopher during his stay in Potsdam between 1750 and 1753. 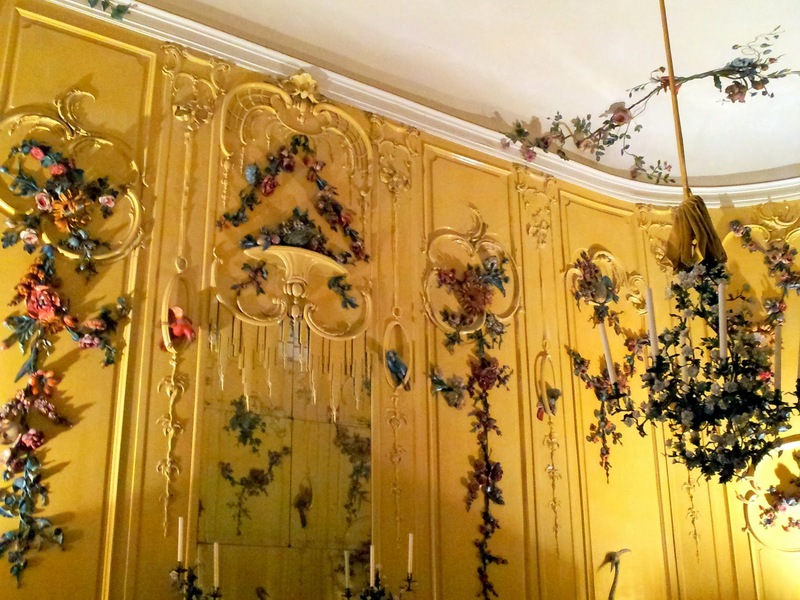 The Voltaire Room was remarkable for its decoration, which gave it the alternative name of the "Flower Room". On a yellow lacquered wall panel were superimposed, colourful, richly adorned wood carvings. Apes, parrots, cranes, storks, fruits, flowers, garlands gave the room a cheerful and natural character. Johann Christian Hoppenhaupt (the younger) designed the room between 1752 and 1753 from sketches made by Frederick.